Cut the butter into chunks and cut into the flour until it resembles coarse meal. Add the buttermilk and mix JUST until combined (mixture should be very wet). 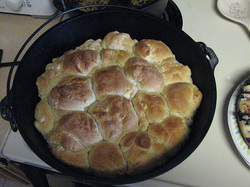 Gently, gently PAT (do not roll with a rolling pin) the dough out until about ½ inch thick. Fold the dough about 5 times, gently press the dough down to 1 inch thick. Place the biscuits in a 12 inch Dutch oven. Use 8 coals on bottom and 18 to 20 coals on top, cook for 12 to 15 minutes. Makes approx. 16 to 18 biscuits.